For the first time Belarus takes part in the Unilever International Schools Art Project (UISAP) – a program, which allows aspiring artists to have their work displayed at London's Tate Modern gallery. This project encourages young people from around the world to create a painting, a sculpture or a small installation on a given theme. This year’s competition invited children to interpret the theme Reality & Dreams. Over 120,000 children have taken part since the project's inception in 2001. 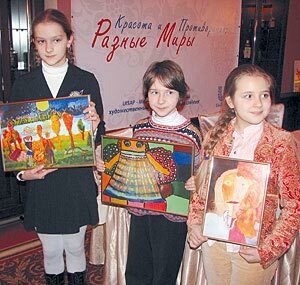 Uliana Garbuz (10 years old, artwork You Can’t Stop the Time), Polina Pugachevskaya (9 years old, artwork I’m Falling onto Heaven and Lena Shepelkina (11 years old, artwork My Land) qualified for the next round and will travel this spring to Saint Petersburg where one of them will be selected to represent Belarus. “I have portrayed an angel”, says Polina, the youngest of the girls, - “I didn’t expect him to be multicolored and motley… I was just in a good mood and it just happened…I was just painting”. "It’s extremely hard to grade children’s creative work”, shares his thoughts the Chairman of the Judges of UISAP in Belarus, a renowned Belarusian artist and designer Vladimir Tsesler, - “All of them are talented until they decide to become an artist, until they understand that they can be praised for drawing and painting. You know that real artists are those who maintain sincerity within and that tiny part of a childish vision of the universe. Everything a child does is a revelation, genuine Art…"